Rebel forces led by al-Qaeda affiliate Jabhat al-Nusra (JN) wrested control of Idlib City from the Assad regime on March 28, 2015. Removing the regime from a second provincial capital is arguably the biggest rebel victory since the fall of al-Raqqa to JN and rebel forces in March 2013. It represents a turning point in the Syrian civil war that is likely to alter the trajectory of the conflict in coming months, with implications for how rebels wage war in 2015. JN and Islamist rebel forces have achieved shocking success in reinvigorating the rebel campaign with the seizure of Idlib City. This is likely to provide momentum to the JN-Islamist axis in Syria at the expense of moderate rebel forces, and hinder efforts to foster a political solution to the conflict. JN and rebel forces seized the northern provincial capital during a swift four-day assault, preceded by days of indirect fire bombardment. The assault exhibited highly effective command and control, which was made possible by a newly formed “operations room” named Jaysh al-Fatah. The operations room had participation from JN; Islamist groups Jund al-Aqsa, Harakat Ahrar al-Sham al-Islamiya (HASI), Faylaq al-Sham, and Ajnad al-Sham; and a few other local groups. By evening on March 27, JN claimed the fall of half of the city and shortly after noon the following day, the Jaysh al-Fatah operations room declared the complete “liberation” of the city. JN immediately raised a JN flag above the governorate building, and tweeted videos purporting to show Idlib civilians celebrating the capture of the city by JN and rebel forces. The offensive was widely covered through social media, with all participating groups using a standardized hashtag as they tweeted their progress against the city. JN also branded its videos and photos with the Jaysh al-Fatah logo, illustrating JN’s desire to nest its military contribution within a wider rebel front. This follows a recent increase in JN twitter activity that makes careful mention of the rebel groups participating in JN-led attacks. A Twitter account was also established for the Jaysh al-Fatah operations room, gaining over 8,000 followers in the first 48 hours of the attack. This social media coverage generated a high degree of visibility regarding the offensive and illustrated the high propaganda value of the successful liberation of a provincial capital. The JN and rebel seizure of Idlib city threatens the Assad regime by challenging its perceived staying power. Assad’s strategy hinges on its ability to maintain outposts in every province in order to portray an image of state power. This image is directly threatened by the loss of a second provincial capital, a psychological blow that may generate asymmetric military effects on other battlefronts. The regime must now defend its remaining isolated enclaves in Idlib Province, northeast, southeast, and southwest of Idlib City from a considerably weakened force posture. The inability to do so will affect Assad’s ability to maintain the support of his population base, which has already begun to show signs of war weariness. The establishment of alternate forms of governance within rebel-held terrain furthermore challenges the regime by offering a possible alternative form of stability. The Syrian National Coalition (SNC) seemingly affirmed this possibility when it issued a statement calling the seizure of Idlib city an important advance along the road to the liberation of Syria and announcing its intent to transfer its headquarters into Idlib City. The fall of Idlib City also threatens the regime’s ability to defend Latakia Province to the southwest. JN and rebel forces remain active in the province’s eastern mountain ranges, where they recently advanced against regime forces to seize the town of Dorin on March 11. After declaring the seizure of Idlib City on March 28, the Jaysh al-Fatah twitter accounted tweeted that it is not a “temporary” operations room and that it will continue its operations soon. This likely indicates JN and rebel intent to capitalize on their victory in Idlib city to deepen the connectivity between JN and rebel-held terrain in Idlib and Latakia provinces, possibly by attacking the regime stronghold of Jisr al-Shughour at the seam between these provinces. This possibility is suggested by a statement released by a Liwa al-Furqan affiliate on March 29 indicating its intent to challenge the regime in Jisr al-Shughour and claiming to form an operations room to liberate the city. The victory in Idlib City is likely to accelerate a shift in the nature and composition of the anti-Assad revolution in 2015 that favors JN. It occurred amidst a renegotiation of how JN and rebel forces cooperate through which JN has increased its relative dominance within rebel ranks. The success of the JN-led Jaysh al-Fatah operations room contrasts with the limited effectiveness of coalitions supported by regional and Western actors such as the Dera’a-based Southern Front and the Revolutionary Command Council. JN’s established value as a partner in the fight against Assad has led numerous rebel groups to deepen their cooperation with JN in order to increase unity across rebel ranks and to prevent an incursion by the Islamic State of Iraq and al-Sham (ISIS) into rebel-held terrain. 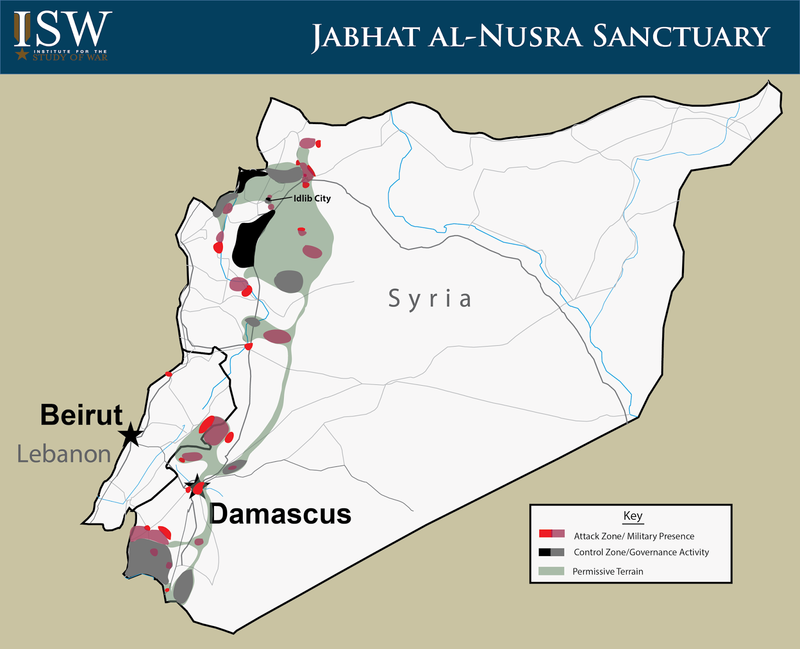 JN is increasingly attractive as a partner to rebel forces on two planes, assisting in the revolution against the Assad regime while simultaneously securing rebel-held terrain against the threat of ISIS expansion. Remaining moderate forces may be forced to seek opportunities to participate in JN-led governance and military initiatives in order to remain relevant as JN and Islamist rebels consolidate their gains in Idlib and move forward with the implementation of governance. The victory in Idlib City is as much or more of a victory for al-Qaeda in Syria than a victory for the Syrian revolution. JN’s success in Idlib will likely validate the al-Qaeda grand strategy in the view of many within the global jihadist community, enabling al-Qaeda to begin to counterbalance the ISIS rise to prominence. JN’s strategy of prioritizing joint governance serves the long-term objective of the al-Qaeda organization to establish an Islamic Emirate in Syria with the support and participation of local populations that can be a future component of its envisioned future global Caliphate. While al-Qaeda may attempt to coerce JN into issuing a more direct challenge to ISIS in Syria in the near term, the success achieved by JN to date is likely to encourage central al-Qaeda leadership to follow JN’s lead and remain invested JN’s long-term strategy. Over time, success in this effort by JN may enable al-Qaeda to invalidate ISIS’s brutal and unsustainable methodology and present its longer-term but still malign alternative. The fall of Idlib City to JN-led rebel forces will reverberate across other Syrian battle lines. As the Assad regime absorbs the loss, it will likely attempt to demonstrate success in its own war effort, possibly by bringing increased combat power to bear on Aleppo City. The regime can be expected to use the fall of Idlib City to propagate its existing narrative that Assad must stay in power to “assist” the international community in “combating terrorism.” Nonetheless, Assad has already begun to retaliate against rebel forces through indiscriminate tactics such as barrel bombs, and is likely to conduct future chemical weapons attacks in the area. Assad therefore continues to be a radicalizing actor whose behavior serves to generate local support for groups such as al-Qaeda who are willing and able to resist. JN is likely to leverage its current momentum to deepen its cooperation with rebel forces on other battlefronts where JN and rebel forces remain less united. Given the dual threat of ISIS incursion and regime advance, rebels are increasingly likely to buy into JN’s model on other fronts. If successful in increasing their military capability through deepened cooperation, JN and rebels may be able to turn momentum in their favor. Resource constraints on all sides of the conflict, however, continue to define the Syrian conflict as one which no actor is capable of winning, ensuring that the war will continue until meaningful international engagement with Syria occurs. The longer this window is kept open, the greater al-Qaeda’s foothold in Syria will become.